The vast Northeast region is home to a variety of landscapes and eco systems. The backland’s forests, mountain ranges, and cliffs lie inlands of 3,500 kilometers of scenic coastline and some of the finest beaches in the country. 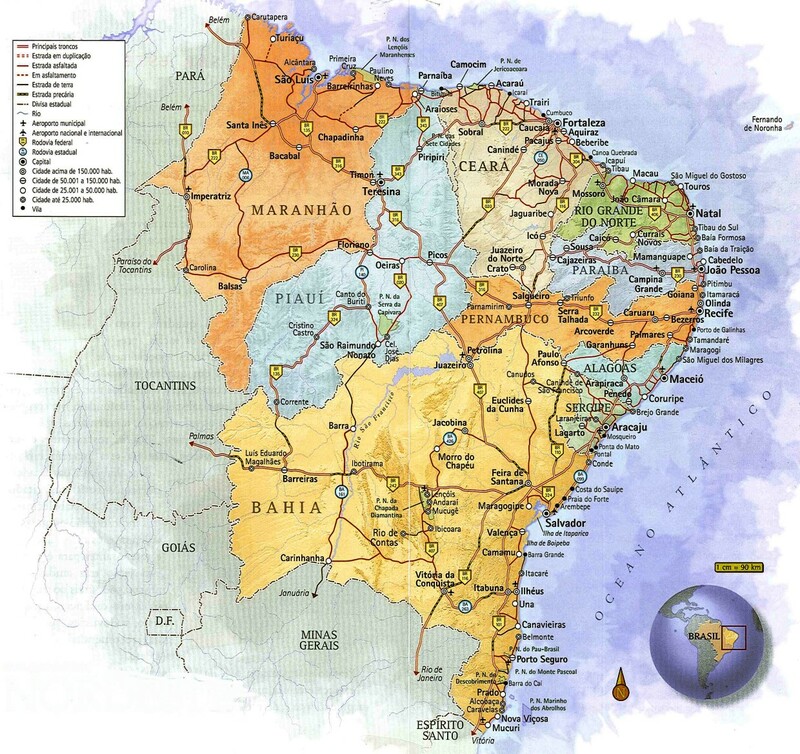 Nine Brazilian states comprise the Northeast. Starting from the south with Bahia, and moving north along the coast, are the states of Sergipe, Alagoas, Pernambuco, Paraiba, and Rio Grande do Norte. The last borders the ocean to the east and north, as the coastline pivots. Moving west along Brazil’s northern coast from Rio Grande do Norte, we have Ceara, Piaui, and Maranhão. Together, these states cover nearly 1.5 million square kilometers (580,000 square miles), or nearly 20% of the country. The Northeast is larger than Portugal, Spain, France, and Germany combined. It’s not surprising, then, that the geography and region of the northeast of Brazil is home to diverse landscapes and climates, from mild green forests to arid backlands, from dramatic mountain ranges to warm, gorgeous beaches, and from stark cliffs to gentle pools of crystal- clear water. These areas host a variety of flora and fauna and provide visitors with a wide range of leisure options. The Northeast has four climate sub- regions and numerous diverse, transitional landscapes, including those known as the zona da mata, the agreste, and the caatinga. The zona da mata is a forested strip with a tropical climate, abundant rains, and fertile soil. It is a thin strip at most 200 kilometers (125 miles) wide and runs along the coastline all the way from Rio Grande do Norte to southern Bahia. The area still retains some of its original landscape, known as Atlantic forest, even though logging practices that began in colonial times have dramatically reduced the forest’s area. Clearance occurred first as colonists exploited the land’s brazilwood, and later as farmers created open spaces for cultivating sugarcane and cacao. More recently, the cellulose industry and uncontrolled urbanization have scarred the land. In the remaining forests and other surviving green areas, animals such as the golden-lion tamarin, muriqui, otter, giant armadillo, and the jaguar live under continual threat of extinction. Inland from the zona da mata lies a semi-arid region known as the agreste. This area is characterized by a patchwork of wet, swampy areas and dry areas. Rainfall can vary dramatically over relatively small distances. In areas where it rains regularly, families practice subsistence farming. In dry stretches, most raise livestock instead. The agreste region contains the greatest concentration of goats in the country. The dry section of the agreste transitions into caatinga, a type of ecosystem found only in Brazil. It exists in all the Northeastern states except Sergipe. In the caatinga there are two seasons: rainy and dry. The word caatinga means “white forest” in the native Tupi-Guarani language. It’s an apt description for the landscape during the dry season, when the dried-out soil cracks and leaves disappear, giving tree and shrub trunks a grayish color. But the barren-looking caatinga conceals rich biodiversity, including cacti like the mandacaru and xiquexique, palm cactus, piassaba palm trees, aveloz, shrubs (including the castor oil plant), and hardwood trees like brauna and tonka. During the rainy season, vegetation bursts forth in many hues. One of the most common caatinga trees is the juazeiro, the only evergreen species in the area. The area’s many indigenous animal include the rock cavy, guinea pig, opossum, brocket deer, and the conu110n marmoset, as well as various lizards, snakes, and birds. Bird watchers may catch a glimpse of picui ground-doves, scaly-headed parrots, caracaras, and picazuro pigeons. Halfway into the state of Piaui, the Northeast’s landscape shifts again. All the way to the state’s border with Maranhão, groves of palm trees known as cocais are common sights. This is the mid-Northeast, a transitional vegetation belt that marks the border between the backlands and the Equatorial Amazon region. Palm trees, including buriti, oiticica, carnauba, and babassu, thrive in the humid climate, and grow larger the closer they are to the Amazon. Oil and wax from these palms have various industrial uses, especially in the manufacture of cosmetics. Birds of the region include rails, tinamous, vultures, hawks, and macaws. Marsupials, bats, predatory mammals, reptiles, and a rat known as the rato-do-mato are also frequent sights. Two mighty rivers run through the Northeast: the São Francisco and the Parnaiba. Smaller rivers tend to disappear during the dry season and thus play a less significant role in local life. The São Francisco River – affectionately known by the people who live along its banks as Velho Chico (“Old Chico”) – begins to the south, in the state of Minas Gerais, and traverses the driest parts of the Northeast as it flows through Bahia, Pernambuco, Alagoas, and Sergipe. The Brazilian government has long toyed with the idea of diverting some of its waters to the driest surrounding areas, but the plan had fallen in and out of favor for many years with no decisive action taken. In 2000 the government once more began to push the project forward amid intense controversy. Hydroelectric plants harness the river’s tremendous power at Sobradinho, Xingó, and Paulo Afonso. The Parnaiba River flows through Ceara, Piaui, and Maranhão. Its mouth, which marks the border between the last two states, forms the Parnaiba Delta, the largest salt-water delta in the Americas. Seventy percent of the delta is considered part of Maranhão, which has recently cultivated an ecotourism industry focused on this important conservation area. The Northeast possesses one-third of Brazil’s coastline, a total of about 3,500 kilometers (2,200 miles) of beaches. Tourists flock to the sands, lured by idyllic images. The reefs, lagoons, cliffs, dunes, lakes, fens, and mangrove swamps serve as habitats for several animal species, including turtles, manatees, crabs, lobsters, and abundant fishes that are critical to the survival of local communities. Thanks to the Northeast’s cultural and geographical variety, it’s easy to see why each visit here is full of surprises and discoveries.